The Gold Coast is renowned for its party atmosphere and what better way to start a party than with a photo booth! In the Booth Gold Coast provides the perfect photobooth hire solution no matter what your event. We love the Gold Coast for its beaches and laid back cultural vibe and are committed to offering the best Gold Coast photo booth hire for weddings, parties, school and corporate events. We’ve had the privilege of boothing it up in some of the most amazing Gold Coast venues and would love to be a part of your next event. Hi, we’re Brett and Sam and we head up the ‘In the Booth’ Gold Coast & Tweed team. It’s our job to provide high quality, memorable experiences for our customers across the beautiful Gold Coast, Hinterlands and Northern NSW. With both hospitality and event management backgrounds, we know how to deliver fantastic customer service. When we’re not boothing it up we love hanging out with our gorgeous girls, camping and relaxing with good food and great friends. We invite you to book one of our photo booths to get your party started.We can assure you the booth will be full all night! Enquire Now for Gold Coast photo booth hire! "Thank you so much for our sneak peek of photos we absolutely love them. Everyone is still talking about what a great idea it was to have a photo booth and Cam and I love the photo album which has photos and messages which we will cherish forever. Huge thank you to our attendant who made our night very relaxing and lots of fun. I know all our guests had a lot of fun with you! We have certainly passed In The Booth information onto our friends who are looking at having one at birthdays and another wedding in Melbourne. So thank you again for making our night that little bit extra special, we really appreciate it." "We recently held our Wedding on the Gold Coast for 130 people and wanted a real wow factor for all of our guests who were coming from New Zealand and Australia and In the Booth gave us just the solution. At first we were hesitant on having one, however every penny was absolutely worth it. Although we had a photographer there taking photos of everyone, people only wanted copies of their In the Booth photos as those were the ones they enjoyed most. It was an absolute blast on the night, and I got my money’s worth with literally thousands of photos as my family from New Zealand are pretty gifted at posing, and they loved it. We highly recommend In the Booth. Awesome event made even better by this company and their service." 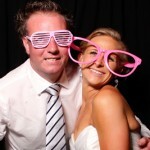 What is it you love about providing photo booth hire services on the Gold Coast? The wedding and function venues on the Gold Coast are top notch. We love to see brides on their special day, walk into a room that they have only ever seen undecorated, and be blown away by the atmosphere. I’m glad to see our photo booths as one of the shining stars. Tell us about some uniquely Gold Coast touches you have seen at an event? The beach ceremony is still very Gold Coast. Lots of relaxed weddings, and diverse venues and reception centres allow functions to be completely unique on the Gold Coast. Photo booth hire is just one element that adds excitement to every event. I’d love to see a couple fresh from the beach ceremony, walk bare feet into my photo booth! 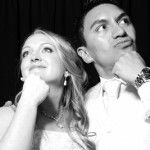 What is the most common question you get asked about the photo booth service you provide? The Gold Coast photo booth hire scene is busy. We go to lots of events every week. Most often guests at a wedding want to know if there are digital copies as well as the prints! Of course the bride or event organiser will always get digital copies of the photos, but guests tend to take better, more candid shots when they are blissfully unaware of the digital footprint being left behind! What are your essential tips for organising a fantastic event? Don’t stress the little things. Trust me, guests really don’t notice if the cake table is on the left side of the room because the light is better there, or that the bow ties on the silk chair covers have an Egyptian knot or a granny knot. Focus (and spend time and money on) on the things they will remember. Dancing, food, speeches, photo booth hire! The entertainment part of the evening is long remembered after the 6 types of Fijian shells chosen for the table centrepiece are long packed away! Get into the Hinterland. Drive up to Springbrook or Tamborine Mountain. There is loads to keep couples entertained. Wineries, breweries, gift shops, great views, amazing local food. Not to mention there are quite a few venues on the mountain if you are looking for something a little less Gold Coast.